A fast-drying, ultra-fine mist aerosol hairspray with firm to ultra-firm hold. This firm to ultra-firm, layer-able hairspray will give your hair a long lasting, firm yet flexible finish that isn't hard feeling. Plus, it will increase your shine by 170% and protect your hairstyle from humidity by 89%, (even after three days). Spray 8-12 inches (20-30cm) from hair for all day hold. Alcohol Denat., Hydrofluorocarbon 152A, Octylacrylamide/Acrylates/Butylaminoethyl Methacrylate Copolymer, Pentapeptide-29 Cysteinamide, Pentapeptide-30 Cysteinamide, Tetrapeptide-28 Argininamide, Tetrapeptide-29 Argininamide, Hydrolyzed Keratin, Cocodimonium Hydroxypropyl Hydrolyzed Keratin, Thermus Thermophillus Ferment, Glycerin, Prunus Domestica Seed Oil, Opal Powder, Polyquaternium-69, Tocopheryl Acetate, Aminomethyl Propanol, PEG/PPG-17/18 Dimethicone, Phenyl Trimethicone, Pentaerythrityl Tetracaprylate/ Tetracaprate, Triethyl Citrate, Benzophenone-4, Butylene Glycol, Limonene, Linalool, Fragrance/Parfum. "I received a free trial size in the mail. It was a great surprise! It held well, smells good, which I like, super fine spray, also a plus. Hold; med-strong." "Hidden gem of a hair spray. Great for up-dos... Think prom and summer style. Holds up to humidity too." Clients Will Love This Too! "This is the best hairspray ever, have tried everything from $-$$$. Nothing compares, great smell, great hold, dry, not sticky, what more could you ask for, I found my new fav!! Now going to try all joico, can't wait! Top of the line...must try." "Power Spray is the BEST! You can work with it, layer it, and finish it to an AWESOME hold. I barely use anything else." "This product is a long lasting hairspray. 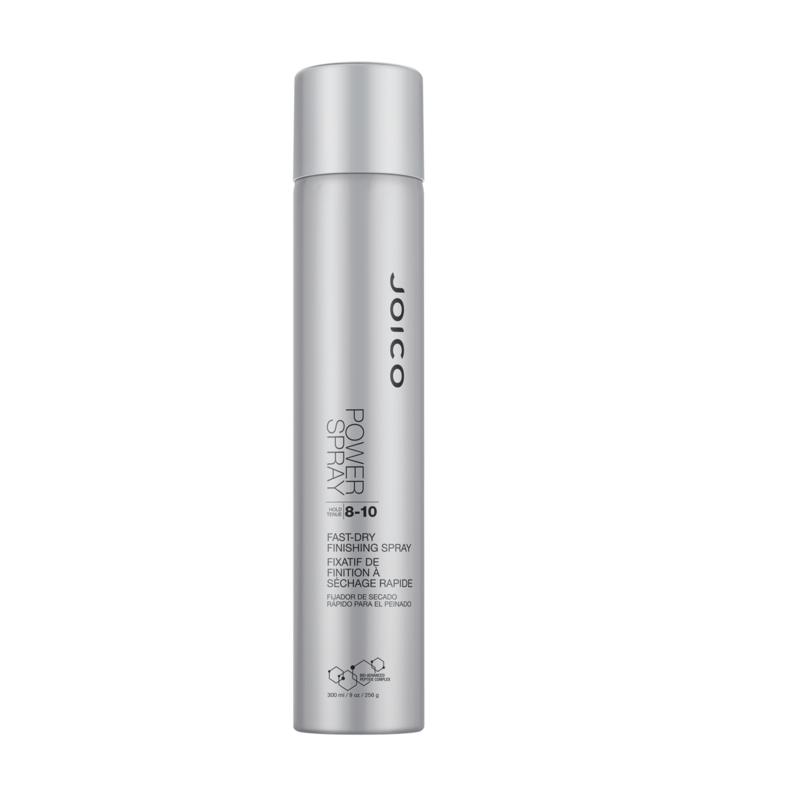 Joico claims it is a "power spray that is a fast drying finishing spray" and I agree with EVERY word. I use it to top off all my special occasion styles as well as any style I want to last through my 12 hour days or for the ladies who come in to get their weekly style. This product has amazing hold, with a fruity feminine scent. It is build-able and light weight so great for all hair types!"